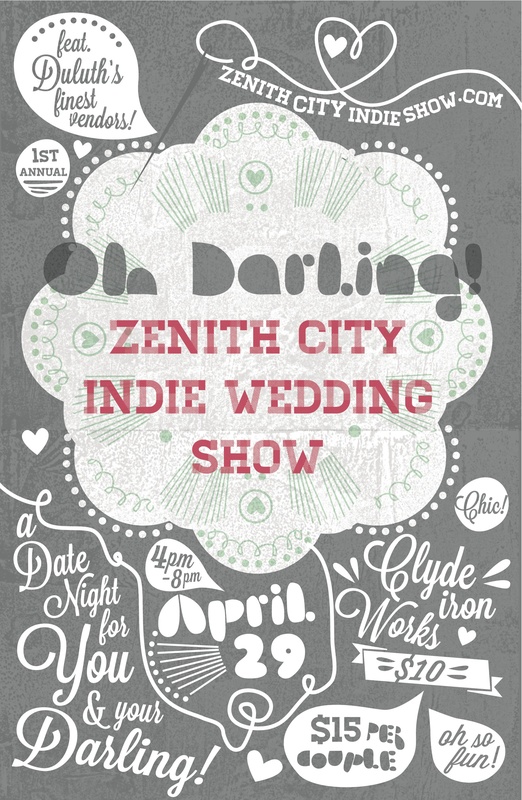 If you’re engaged, living in Duluth, MN, and not living under a rock, hopefully you’ve caught the buzz going on about the first annual Zenith City Indie Wedding Show. If you HAVEN’T heard of it yet, you’re not too late! Click the link, take in some of it’s golden-ness, and then come back here for a chance to win free tickets! Like both The Zenith City Indie Wedding Show‘s and Derick Cich Makeup Artistry‘s Facebook Pages. Follow both The Zenith City Indie Wedding Show and Derick Cich Makeup Artistry on Twitter. That’s it! Two lucky winners who have completed the above three steps will be randomly chosen and contacted this Thursday, April 26th. The winners will simply have to show up, give your name at the door, and walk in, VID (Very Important Darling) style. For those of you who don’t want to risk missing the show with the event selling out, you can purchase your tickets right now here or in person at Saffron and Grey in Duluth (2303 Woodland Avenue). This entry was posted in Other and tagged contest, duluth, mn, saffron and grey, tickets, zenith city indie wedding show. I first heard about it through a Facebook invite from Jordan Shermer. I heard about the show from Saffron and Grey’s Facebook statuses!